Rachel takes the same commuter train every morning and every night. Every day she rattles over the same track junctions, flashes past the same stretch of cozy suburban homes. And every day she stops at the same signal and she sees the same couple, breakfasting on their roof deck, living the perfect life that Rachel craves for herself – a lifestyle she recently lost. She looks forward to observing this household every morning, even makes up names and narratives for its residents. Then one day Rachel sees someone new in their garden, and soon after, the woman who lived there disappears. Unable to keep this information to herself, Rachel offers what she knows to the police, and in the process is drawn into the lives of the couple she thought of as Jason and Jess but whose names – she has learned from the news – are really Megan and Scott Hipwell. But the police accuse Rachel of being unreliable, and it’s true that her memories can’t always be trusted. Plus there are the stories that her ex-husband’s new wife has been spreading about her. By the time Megan’s body is found, Rachel is in over her head, intricately entangled in the details of the investigation, as well as in the lives of everyone involved. Has she put others in danger? Has she done more harm than good? A compulsively readable, emotionally immersive, Hitchcockian thriller that draws comparisons to Gone Girl, The Silent Wife, or Before I Go to Sleep, this is an electrifying debut embraced by listeners across markets and categories. Strangely given all the hype I was surprised when I went to get the blurb how low the rating is for this book but I think I get why and also why as an audio book this might actually blow the written version out of the water. The story is told from multiple viewpoints, three distinctively different women with three very different views on what is happening within the story, obviously I can only speculate given I did not read the written version but I suspect it can get hard to keep the three separate in your head. The advantage of this audio version is each of the women is narrated by a different actress, and they are all incredibly talented ladies. The story plays with the idea of memory, not only the unreliable one of Rachel but also the way in which it is selective and allows people to fool themselves into believing their own take on things. In the end though the story is about love, betrayal and heartbreak, though the characters are very different in one way or another they are all self destructive, searching to find fulfilment in the wrong places and irreconcilably bound together by an invisible thread. 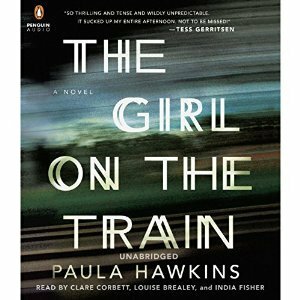 Would I recommend this book yes but I would add the proviso that I would recommend this audio book even higher, there is talk of a film but I have to say if they do they need to use this same cast and even then I am not sure it can out do this, a huge 5 out of 5 stars. I’ve seen lots about this book, but not read it (yet?) The film is nearly ready I think – I saw a trailer somewhere. Emily Blunt is Rachel and the action has been moved to New York. I suspect you won’t be impressed with that! I don’t think the location actually matters so much in this as it is far more about the characters themselves but it will definitely be interesting to see how the dynamics of the casting play out. Good review, Paula. I read the book months ago, and maybe would have enjoyed it more on Audio. The page-turning part of it was good; I just had a difficult time because I didn’t like one single character in the book! This book was chosen by my book club, so I read it a few months ago. It’s a powerful story which I found impossible to put down, in spite of the fact that I didn’t like a single one of the characters (although I feel this only gives further kudos to the author for making them so dysfunctional in their own individual ways as to make them distasteful. Anna, especially, rubbed me up the wrong way, with her paranoia and clingyness). I found it to be reminiscent of Dorothy Koomson’s work and so – in spite of my general dislike for everybody (my book club all felt that we weren’t actually supposed to like the protagonists) – I enjoyed the harrowing tale.